It Costs Less To Do It Right The First Time! Why Choose Magnum Auto Restoration? We've been restoring, parting, and assembling cars for over 20 years so we know where and how the parts work. We attend several car shows and swapmeets throughout the year with the biggest ones being the Chryslers at Carlisle show in PA and the Mopar Nationals. What you get from Magnum Auto Restoration is professional service, attention to detail, and a well thought out process from people that share your love of cars and realize your car, is your pride and joy. 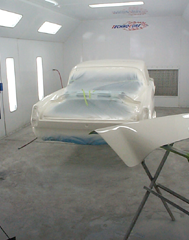 With almost 10,000 square feet of space dedicated to just restoring cars, we have the ability to do just about anything you need done. From small repairs, upgrades, or complete rotisserie nut and bolt restorations. We are located just off I80 in LaSalle, IL. Take exit 77 on I80 and go 1/2 mile south to our new facility at 11 Gunia Drive.